Mental illnesses are among the most common health conditions in the world, yet sensationalized news coverage or underreporting of these issues can perpetuate myths and misconceptions about mental illnesses and discourage people from seeking effective treatment. Carter Center fellows receive intensive training from leading mental health and journalism experts and a USD 10,000 stipend (or a comparable amount for international fellows) to report on a mental health topic of their choice. The Fellowship Program challenges recipients to delve deeper into learning about a mental health issue of interest to ensure the general public is provided with reliable information about mental illnesses. 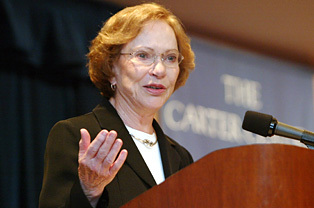 Over the history of the program, Rosalynn Carter fellows have produced more than 1,300 mental health-related stories: eight books in conjunction with the fellowship; five documentary films with two films in the final stages of completion; hundreds of newspaper, magazine, and online pieces; multiple hours of radio and TV airtime; and innovative uses of multi-media. Former fellows have been nominated for the Pulitzer Prize and won Emmy and Peabody Awards for their fellowship projects. The fellowship program is part of the Carter Center’s Mental Health Program, which works around the world to provide the public with accurate and balanced depictions of those with mental illnesses to reduce stigma and discrimination. Topic: Investigate people who have been sentenced to life without parole for crimes committed when they were under 18 years of age and how mental health plays a part in the lives of these young people, both in early childhood, and in the subsequent decades in prison. Topic: Create The Elements of Mental Health and Well-being: Developing a journalistic conversation about current research aimed at young readers. Topic: Explore the impact trauma has on learning and how schools in Washington, D.C. are responding to children’s social and emotional needs. Topic: Examine what happens to low-income, uninsured Oklahomans who suffer from serious mental illnesses and substance abuse that are stuck on the state mental health agency’s waiting list and unable to afford care on their own. Topic: Explore the barriers to mental health treatment for veterans with less than honorable discharges, who are often denied care by the VA health care system. Topic: Investigate the misuse of second generation antipsychotics in children and adolescents on Medicaid. Topic: Develop a four-part multi-media series that investigates the mental health perspective of the indigenous and Afro-Colombian communities and explains the challenges that surface when trying to establish a dialogue between traditional medicine in these minority communities and Colombia’s public and private health institutions. Topic: Investigate and evaluate the effectiveness of the Colombian government’s ‘Program for Psychosocial Care and Comprehensive Health for Victims of Armed Conflict’ (PAPSIVI) and examine the impact that violence has had on the mental health of Colombians, specifically investigating two fronts: sexual violence toward women and displacement.